This was blocked last week, but I am still waiting for a nice sunny day to make an outside picture. I’ve given up that hope now, and just made a picture in front of the window. It is really gloomy weather here at the moment, the snow is melting and it’s raining now. 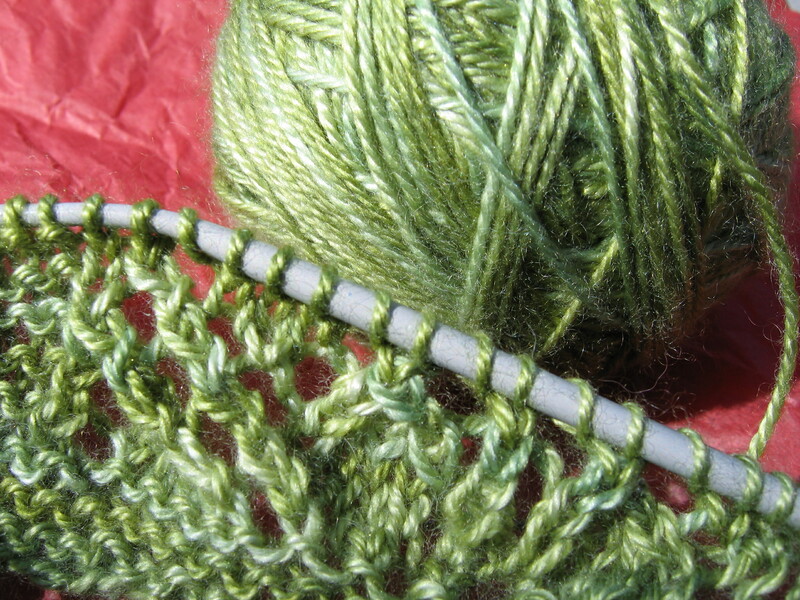 But about Branching Out: at first I found this shawl very hard to do. I didn’t find it suitable for someone new at lace knitting, like me. It lay it in my knitting basket for a long time. In the meantime I worked on Willow from Kim Hargreaves and that turned out to be a much better first lace project for me. It has a very easy lace repeat, mostly yo’s and purl2together. After that I picked up my Branching Out scarf again. It still wasn’t easy but it went a lot better than before knitting Willow. I just knitted one repeat every time I felt like it. And every repeat was getting easier. I knitted from the written instructions, because I found the chart very confusing because the purl rows and the side stitches aren’t charted. It was getting easier and easier. Although I never managed to learn to “read my knitting” on this pattern (I could on Willow, but not on this one). The pattern was getting more and more fun and one day it was finished. What I don’t like about this pattern, that it looks like a real easy scarf. Because it’s so thin, it has “beginner” written all over it. But it is not as easy as it looks. 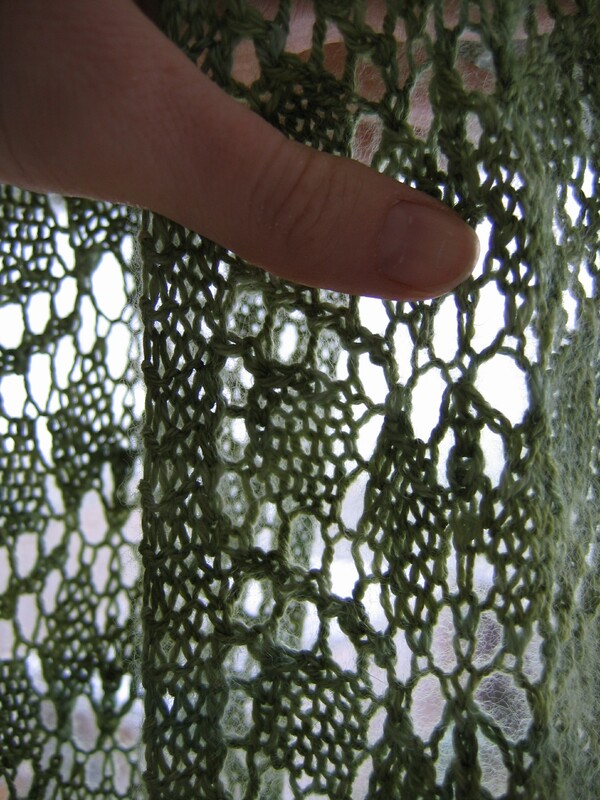 I prefer it the other way around, especially for a first lace, I think it should be motivating you to make more lace. But I did learn a lot from this project. It uses a lot of different stitches, and because you are repeating them over and over again, I don’t think I will ever forget them. So it’s certainly very useful for learning lace. I would recommend it as a second or third lace project. The yarn: this is a wonderful yarn. It’s expensive but it’s worth it’s price. It is very soft, has a subtle sheen. The colour is amazing, I used Moss, a semisolid green. I’ve been able to do 40 repeats of the lace pattern with one skein. One day I will buy two skeins and make a nice big lace shawl from it.